Overview: What are the thresholds of barrier-island stability? Why do they switch between phases of erosion, migration, and growth, and what are the implications for backbarrier marshes and lagoons? Studies as part of this project include a test of the relationship between backbarrier marsh loss and barrier-island migration rates (published in Geology in 2017), an investigation of the geologic evolution of Parramore Island, VA (published in Marine Geology in 2018), and several studies in prep that investigate the economic impacts of marsh-based blue-carbon loss due to barrier rollover, and which use cross-shore morphodynamic models to explore the role of antecedent stratigraphy on barrier-island stability and the role of long-shore sediment supply in beach and foredune ridge growth. Overview: What is the role of updrift sediment sinks in driving downdrift barrier-island stability? For this newly initiated study, we are conducting stratigraphic, geomorphic, and process-based studies of the Chincoteague-Assateague-Wallops (C-A-W) island system to determine controls on alongshore sediment fluxes to the Virginia barrier islands to the south. Overview: We are studying the links between backbarrier sedimenation, late Holocene marsh growth, modern marsh deterioration behind Plum Island to test the "runaway transgression" hypothesis. We run this process in reverse by "backstripping” of the sediment surface to various time periods using average marsh and backbarrier sediment accumulation rates allows for the determination of paleo-tidal prisms. Combined with hydrodynamic modeling of backbarrier processes at various stages of infilling, this study demonstrates the direct impact of backbarrier sedimentation on tidal-inlet closure and barrier-island development. Work from Jenn Connell's senior thesis studying vertical marsh accretion and human impacts on backbarrier sedimentation are being incorporated into these same hydrodynamic models for the modern system to test the future stability of the marsh — and by extension, the barrier island — system. 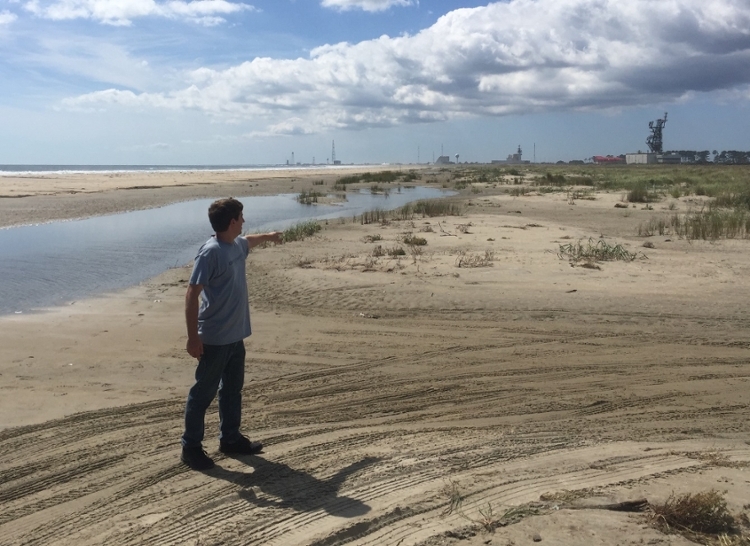 Overview: This project addresses fundamental social- and natural- science questions surrounding coastal erosion that arise in response to insufficient supplies of sediment in a regime of accelerated sea-level rise and enhanced storminess. The Merrimack River and Plum Island barrier system have undergone wide-ranging human alterations which, combined with complex climate-change impacts, have dramatically reduced fluxes of sediment from both fluvial and nearshore sources, resulting in severe erosion. This study evaluates the relationship between the millennial-scale record of sediment from the Merrimack River and the stability of Plum Island through the development of an 8000-year record of organic-biomarker proxies to quantify relative changes in the contributions of fluvial and shelf sources of sediment through time. It also employs historical and economic records and datasets, the correlation of >60 years of coastal-process and shoreline-mapping studies along Plum Island, and the development of down-core geochemical proxy records of anthropogenic impacts on fluvial sediment delivery to the coast, to detail the history of human modifications and evidence of geological responses. Andy Fallon's masters thesis and senior reseach projects by Sarah Baker, Haley Gannon, and Brody Marino, REU projects by Justin Shawler and Rebecca Whitney, and a honors thesis by Justin Shawler (see People page) all were derived from this study. 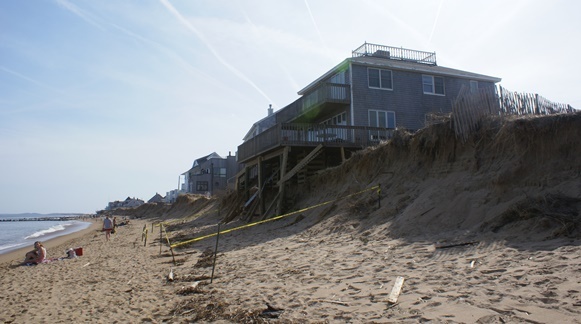 Publications include studies of historic shoreline change and inlet-associated mechanisms from the 2015 Coastal Sediments Conference and the 2016 International Coastal Symposium, and a study in Coastal Management about the economic impacts of barrier-island erosion, and several forthcoming on natural and human impacts on sediment delivery to, and stability of, the Plum Island beach shoreline. *Raff, J.L., *Shawler, J.L., *Ciarletta, D.J., Hein, E.A., Lorenzo-Trueba, J., Hein, C.J., 2018, Insights into barrier-island stability derived from transgressive/regressive state changes of Parramore Island, Virginia, Marine Geology, v. 403, p. 1-19, doi:10.1016/j.margeo.2018.04.007. FitzGerald, D.M., Hein, C.J., Hughes, Z., Kulp, M., Georgiou, I., Miner, M., 2018, Runaway barrier island transgression concept: global case studies. In: Moore L., Murray A. (eds) Barrier Dynamics and Response to Changing Climate. Springer, Cham, p. 3-56, doi:10.1007/978-3-319-68086-6_1. *Fallon, A.R., Hoagland, P., Jin, D., Phalen, B., Fitzsimons, G., Hein, C.J., 2017, Adapting without retreating: Responses to shoreline change on an inlet-associated coastal beach, Coastal Management, v. 45, n. 5, p. 360-383, doi:10.1080/08920753.2017.1345607. *Deaton, C.D., Hein, C.J., Kirwan, M.L., 2017, Barrier-island migration dominates ecogeomorphic feedbacks and drives salt marsh loss along the Virginia Atlantic Coast, USA, Geology, v. 45, no. 2, p. 123-126, doi:10.1130/G38459.1. Hein, C.J., Fitzsimons, G.G., FitzGerald, D.M., *Fallon, A.R., 2016, Records of migration and ebb-delta breaching at historic and ancient tidal inlets along a river-fed paraglacial barrier island, Journal of Coastal Research, SI 75, p. 228-232. *Rogers, L.J., Moore, L.J., Goldstein, E.B., Hein, C.J., Lorenzo-Trueba, J., Ashton, A.D., 2015, Anthropogenic controls on overwash deposition: Evidence and consequences, Journal of Geophysical Research - Earth Surface, doi: 10.1002/2015JF003634. Fallon, A.R., Hein, C.J., Rosen, P.S., Gannon, H.L., 2015. Cyclical shoreline erosion: The impact of a jettied river mouth on the downdrift barrier island, In: Coastal Sediments ’15, Proceedings of the 11th International Symposium on Coastal Engineering and Science of Coastal Sediment Processes. Hein, C.J., and Stone, B.D., 2014, Ice, water, and wind: A source-to-sink view of the glacial, paraglacial, and coastal sediments and processes that have shaped northeast Massachusetts, In: Thompson, M., Field Trip Guide for the 106th Meeting of the New England Intercollegiate Geological Conference (NEIGC), Wellesley MA, 10 October 2014, Field Trip A5, 38 p.
Hein, C.J., FitzGerald, D.M., *Carruthers, E.A., Stone, B.D., Barnhardt, W.A., Gontz, A.M., 2012, Refining the model of barrier island formation along a paraglacial coast in the Gulf of Maine, Marine Geology, v. 307-310, p. 40-57. Hein, C.J., FitzGerald, D.M., Stone, B.D., *Carruthers, E.A., Gontz, A.M., 2011, The role of backbarrier infilling in the formation of barrier island systems, In: Kraus, N.C., and Rosati, J.D. (Eds), Coastal Sediments ’11, Proceedings of the 8th International Symposium on Coastal Engineering and Science of Coastal Sediment Processes, p. 687–690. Hein, C.J., Hoagland, P., Huang, J.-C., Canuel, E.A., Fitzsimons, G., Rosen, P., Shi, W., *Fallon, A.R., *Shawler, J., 2017, Centennial-scale human alterations, unintended natural-system responses, and event-driven mitigation within a coupled fluvial-coastal system: Lessons for collective management and long-term coastal change planning, AGU Fall Meeting, New Orleans, LA, December 2017. 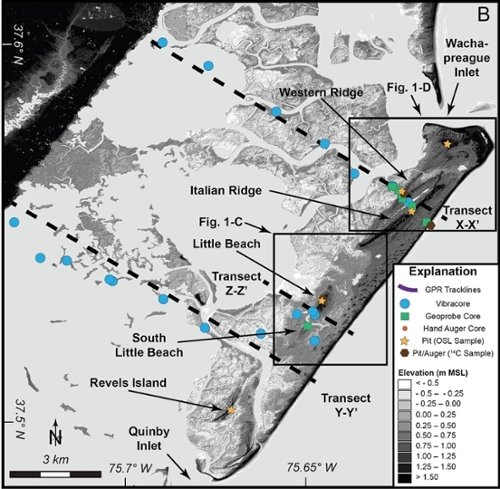 *Shawler, J., Seminack, C.T., *DeMarco, K.R., Hein, C.J., Petruny, L.M., 2017, Records of coastal change within a progradational, wave-dominated barrier island: Morphostratigraphic framework of the southern recurved spit of Assateague Island, VA, AGU Fall Meeting, New Orleans, LA, December 2017. *Ciarletta, D., Lorenzo-Trueba, J., *Tenebruso, C., *Shawler, J.L., Hein, C.J., 2017, Coupled modeling and field approach to explore patterns of barrier ridge and swale development, AGU Fall Meeting, New Orleans, LA, December 2017. *Vaughn, J.P., Fenster, M.S. Hein, C.J., *Shawler, J., McFarland, E.R., 2017, Reconstructing the Pleistocene geologic and evolutionary history of Virginia’s Eastern Shore during and following the Sangamonian interglacial period, AGU Fall Meeting, New Orleans, LA, December 2017. Hughes, Z.J., Georgiou, I.Y., Gaweesh, A., Hannegan, K., FitzGerald, D., Hein, C.J., 2017, Sediment transport trends in the Great Marsh, MA, AGU Fall Meeting, New Orleans, LA, December 2017. *Shawler, J., *Raff, J.L., Hein, C.J., 2017, Holocene backbarrier development in response to sea-level rise, antecedent topography, and barrier geomorphic change: Parramore and Cedar islands, Virginia’s Eastern Shore, Geological Society of America Southeast Section Meeting, Richmond, VA, March 2017. *Raff, J.L., *Shawler, J., *Ciarletta, D.J., Hein, C.J., Hein, E.A., 2017, Barrier island change along the Eastern Shore of Virginia: Insights from a chronological and sedimentological study of Parramore Island, Geological Society of America Southeast Section Meeting, Richmond, VA, March 2017. Hein, C.J., *Fallon, A.R., FitzGerald, D.M., Fitzsimons, G., 2016, Records of migration and ebb-delta breaching at historic and ancient tidal inlets along a river-fed paraglacial barrier island, International Coastal Symposium (ICS2016), Sydney, Australia, February 2016. *Shawler, J., Hein, C.J., 2016, Estuarine records of long-term human impacts on fluvial sediment discharge from a large New England river, Geological Society of America Southeast Section Meeting, Columbia, SC, March 2016. *Deaton, C.D., Hein, C.J., Kirwan, M.L., 2015, Barrier island migration, salt marsh loss, and ecogeomorphic feedbacks on the Eastern Shore of Virginia, Geological Society of America Annual Meeting, Baltimore, MD, November, 2015. *Shawler, J., Hein, C.J., 2015, Multi-Proxy Records of Anthropogenic Impacts on Fluvial Sediment Supply from the Joppa Flats tidal flats, northern MA, Geological Society of America Annual Meeting, Baltimore, MD, November, 2015. *Fallon, A.R., Hein, C.J., Rosen, P.S., *Gannon, H.L., 2015, Cyclical shoreline erosion: The impact of a jettied river mouth on the downdrift barrier island, Coastal Sediments ’15, San Diego, CA, May, 2015. 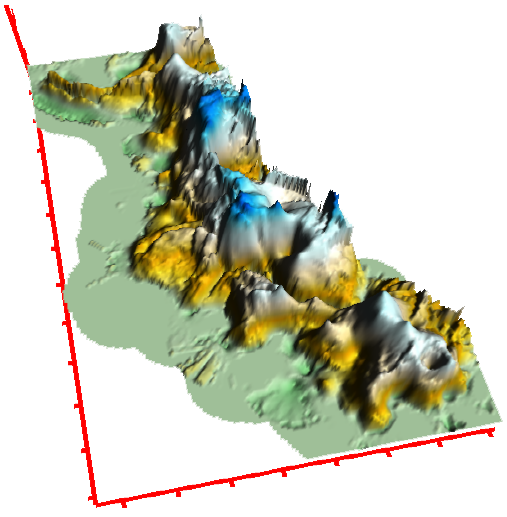 Hein, C.J., FitzGerald, D.M., Georgiou, I.Y., Hein, E.A., 2014, INVITED, Coupled Barrier-Backbarrier Dynamics and the Formation and Stability of Barrier-Island Systems, GSA Abs. with Programs, vol. 46, no. 6, abs. 249075. Hein, C.J. and FitzGerald, D., 2011, The role of backbarrier infilling in the formation of barrier island systems, Coastal Sediments ’11, 2-6 2011, Miami, Florida, USA. Hein, C.J. and FitzGerald, D., 2011, Barrier evolution in response to inlet closure: An example from a paraglacial barrier system, GSA Abs. with Programs, vol. 43, no 2, p. 24. Hein, C.J., FitzGerald, D.M., Stone, B.D., *Carruthers, E.A., Gontz, A.M., 2009, The Role of Backbarrier Filling in the Evolution of a Barrier Island System, Eos Transactions, AGU, Fall Meeting Suppl., Abstract EP43A-060. Hein, C.J., FitzGerald, D.M., *Carruthers, E.A., Stone, B.D., 2009, Tidal Prism Reduction, Backbarrier Infilling, and Inlet Closure: The Formation of the Plum Island, MA Barrier System in Response to Slow Sea-Level Rise, Northeast Shore and Beach Preservation Association Meeting, Woods Hole, MA, 22 September 2009. Hein, C.J., *Carruthers, E.A., FitzGerald, D.M., Barnhardt, W., Stone, B.D, 2009, Evolution of a Barrier System in Response to Slow Sea Level Rise and Backbarrier Infilling: Plum Island, Massachusetts, American Association of Petroleum Geologists Annual Convention and Exhibition, 9 June 2009. Hein, C.J., *Carruthers, E.A., FitzGerald, D.M., Barnhardt, W., Stone, B.D, 2009, Development of the Plum Island, MA Barrier System in response to Slow Sea Level Rise. GSA Abs. with Programs, vol. 41, no 3, p. 85. *Carruthers, E.A., Hein, C.J., FitzGerald, D., Stone, B.D., *Ellison, M.S., 2008, Redefining the Model of Barrier Island Formation Along a Paraglacial Coast: Plum Island, MA, GSA Abs. with Programs, vol. 40, No. 6, p. 158. Hein, C.J., FitzGerald, D., Stone, B.D., *Ellison, M.S., *Carruthers, E.A., 2008, Formation and Evolution of a Paraglacial Barrier System: Plum Island, MA, Association of American Geographers Annual Meeting, Boston, MA, 24 April 2008. Hein, C.J., FitzGerald, D., Barnhardt, W., 2007, Patterns and Mechanisms in Sediment Transport Processes Inferred from Geophysical and Sedimentological Surveys Offshore of the Merrimack River, Northern Massachusetts, Coastal Sediments ’07: New Orleans, LA, May, 2007. Hein, C.J., FitzGerald, D., Barnhardt, W., 2007, Holocene reworking of a sand sheet in the Merrimack Embayment, Western Gulf of Maine, International Coastal Symposium 2007: Gold Coast, Australia, 16-20 April, 2007. Barnhardt, W., Andrews, B., Ackerman, S., Baldwin, W., Hein, C.J., FitzGerald, D., 2007, Geologic framework of the Massachusetts inner continental shelf: Preliminary results of seafloor mapping, GSA Abstracts with Programs, vol. 39, No. 1, p. 81. Hein, C.J., FitzGerald, D., Barnhardt, W., 2006, Holocene Sedimentological Evolution of the Merrimack River Paleo-Delta; And Speculation for Future Sediment Contributions to the Onshore Barrier System, Association of Engineering Geologists: Annual Conference, Boston, MA, 3 November, 2006. Hein, C.J., FitzGerald, D., Barnhardt, W., 2006, Reworking of a Submerged Fluviodeltaic sequence in the Merrimack Embayment, Western Gulf of Maine, GSA Abs. with Programs, vol. 38, No. 7, p. 376. Hein, C.J., FitzGerald, D., Barnhardt, W., 2006, Holocene Sedimentological Evolution of the Merrimack Embayment, Western Gulf of Maine. GSA Abstracts with Programs, vol. 38, No. 2, p. 28.